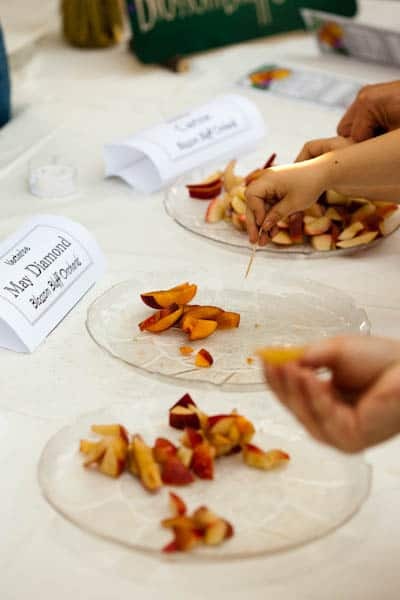 Saturday night I had the pleasure of attending The Organic Stone Fruit Jubilee, a great event celebrating 60 varieties of peaches, nectarines, apricots, plums, and pluots from about a dozen local certified organic farms. After enjoying some music and eating delicious pulled-pork sandwiches topped with grilled peaches, we wandered from table to table chatting with farmers and sampling more varieties of stone fruits than I ever knew existed! Needless to say, I walked away from the jubilee with bulging bags of peaches, nectarines, and apricots. The peaches won’t be fully ripened for another day or two, but the nectarines were perfect Sunday morning. I couldn’t resist eating slice after slice of the delicious fruit while cutting it up for the muffins. 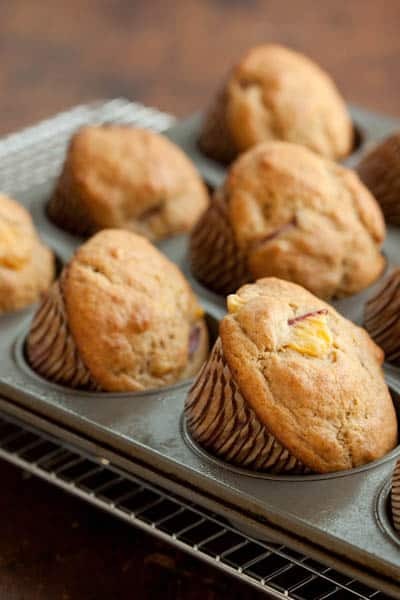 I had never made nectarine muffins before, but I knew I wanted a recipe that included buttermilk. 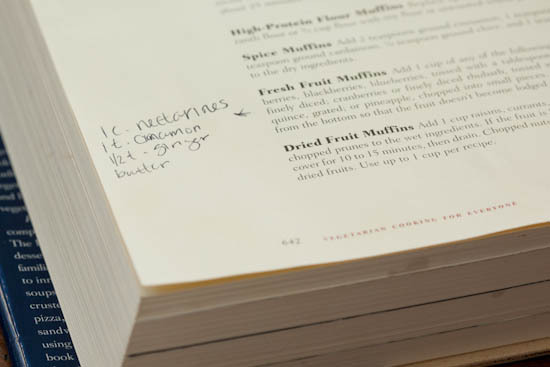 I turned to my favorite buttermilk muffin recipe in the book Vegetarian Cooking for Everyone as a starting point and was happy to see instructions for adapting the basic recipe to make fresh fruit muffins. Although nectarines weren’t on the list of recommended fruits, I knew they would work well here. I also decided to add a bit of ground cinnamon and ginger as I really enjoy those flavors with peaches and nectarines. The muffins were amazing – sweet, tart, and tender. They reminded me of a nectarine cobbler, which says a lot since cobbler is one of my favorite desserts. I was really happy to be able to share them with both my dad and my grandpa on Father’s Day. It’s nice to be home. Preheat oven to 375 degrees. Grease a 12-cup muffin tin or line with paper cups. In a large bowl, whisk together the flour, baking powder, baking soda, cinnamon, ginger, and salt until well combined. In a separate smaller bowl, whisk together the eggs, buttermilk, brown sugar, melted butter, and vanilla extract. Pour the wet ingredients into the dry ingredients and stir with a large spoon until just combined (make sure to scrape all the flour up off the bottom of the bowl). Gently fold in the diced nectarines. Divide the batter between the 12 muffin cups (a mechanical ice cream scoop works great for this) – they will be almost completely full. Bake at 375 degrees for about 25 minutes or until a toothpick inserted in the middle of a muffin comes out clean. I am so jealous of your muffins and your yummy fruit tasting! These look delicious, Nic! I have never tried nectarine muffins, but by the looks of these and the list of ingredients - I love spices - I'm sure I'd have seconds! Thank you for the recipe. Nectarines are my favorite, I'll be making these today or tomorrow. I love nectarines and plums, but other than just eating them, I've never been too good and coming up with alternative uses for them. This helps a lot!! Cheers. I love using Bittman as a jumping off point for recipes like this. He is so adaptable. 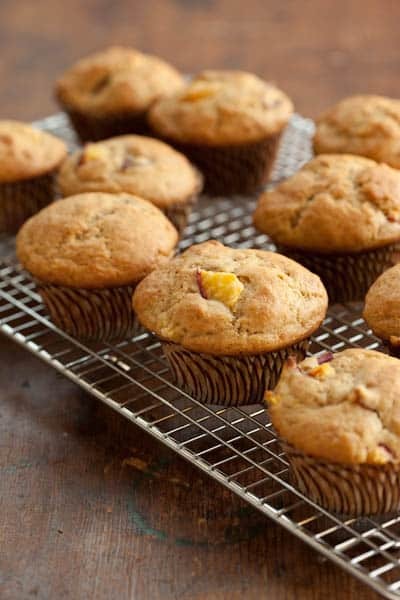 These muffins sound fantastic, and filled with the perfect spices to complement the nectarines! My mom always buys nectarines in the summer. I used to prefer its fuzzier, sweeter cousing, the peach, but now I really appreciate its distinctive taste. I've made it into pies, but muffins sound good! If you like a sweet, tender, tangy muffin you will love these. so good !!! thank you for sharing, Nicole. Yum, you had me at nectarine cobbler! I am a huge cobbler fan, and nectarine cobbler in the form of a neat and tidy muffin sounds incredible. One of the interesting things about nectarines is their flavor becomes ultra concentrated with time. Leave a few out of the refrigeratory until they shrink a bit, and the skin begins to shrivel, just a few days, but not to the point of being mushy, you will be amazed at the dense flavor...cheers! If these remind you of cobbler, I am so game! They sound amazing. Lisa: Peaches would be fine, just try to use firm-ripe ones. Enjoy! I'm glad you've found some good nectarines... I've been finding a lot of mealy ones. I catered an event over the weekend though and grilled some peaches that were borderline and it made them amazing... plus the whole place smelled like peach pie : ) I'll give these a try soon. I made these today with the organic nectarines from my CSA box and they were fantastic! I shared with my neighbors and they loved them as well. Thank you so much for the recipe! I made these today! Can't wait until they come out of the oven. I picked up some recipe cards at my local supermarket yesterday and one was for nectarine buns! Shame they put the recipe out after the checkout else I'd have picked some up! I just made these and WHOA! They're sooo yummy! yum... I can taste and smell it! Hi Paul, You are right, that was a typo! Thanks for pointing it out, I just fixed it. Hope you enjoy the muffins! These muffins were positively delicious. They raised up beautifully and the subtle spice mixed with the taste of the nectarines was perfect! It's nice to find a muffin that turns out to be a total delight. I would highly recommend these for anyone to try. I might try these with strawberries and see what happens! These muffins were wonderful- next time I would definitely add more nectarines though. Did anyone else get 18 muffins from this recipe?